a real advancement of knowledge in all the involved cultural fields. We intend, therefore, to explain and show the outstanding results of the over mentioned studies and projects, offering to the international debate a chance to reflect and a real advancement of our attitude on the destiny of ancient monuments, in the contemporary cultural and social situation. When we speak about the studies on existing architectures we often ignore that they could assume two different meanings and, under a certain point of view, two dialogical aspects. The first aspect considers analysis like a simple instrument to collect various kind of information practically useful for intervention. Among these analyses, are those regarding structural defects and disease, the forms of mechanical, physical, chemical and biological degradation or those directed to recognise the materials or to control the environment. The second aspect of the studies on existing architecture, on the contrary, identifies the analysis with a precious chance to "understand" historic buildings and to open new perspectives for knowledge itself. Stratigraphic and archaeological researches, historical inquires, geometrical measurement, as many others studies, belong to this second kind of attitude. Meanwhile, when we deal with analysis in the field of diagnostic studies we often forget to distinguish these two different ways of thinking and operating. For the same reason, we generally use the expression "knowledge" without considering that ancient monuments are built with materials belonging to the "universe of nature", but also with forms, ideas and instruments belonging to the "artificial universe of human culture". We cannot make confusion between these two levels of problems and we must not reduce ancient buildings to a simple sum of physical or chemical phenomena. On the other hand, we cannot give absolute prominence only to the exterior and formal aspects of the monument without considering its material, structural and constructive consistence. Ancient monuments and historic buildings are the precious sign of our past, they are non-replaceable fragments of our cultural heritage and their future depends on our attitudes and actions. For this reason we must study ancient buildings to understand their conditions, their problems, but also their values and meanings. A great aid to achieve this result can derive from the wide and complex technological and scientific field of the non-destructive techniques, which are today available for the analysis of architecture. In this field, our School of Specialisation usually works too and, for this reason, we try to show, here, some outstanding results of its students', teachers' and technicians' efforts. The "School of Specialisation in Monuments Restoration" of the University of Genoa was founded in 1994 and is one of the five now operating in Italy, directed by prof. Paolo B. Torsello. Its institutional finality, according to its statute, is:"to provide a specific professional preparation in architectural preservation, complementing the university studies, and to allow achievement of a wider and more extensive knowledge of methods and techniques for the protection and conservation of architectural and environmental heritage". Through its educational function, the School offers, therefore, a constructive contribution to the community commitment towards conservation of historical heritage, because an essential part of the solution that can be given to the problems of protection depends on the presence of operators in possession of adequate theoretical preparation. the quality control of the results, and so on. It is therefore necessary to conceive a typical operator who, after acquiring an adequate university instruction in the field of architecture, has also received a deep and specific theoretical and practical preparation in the field of preservation and restoration. The subject matter of the latter refers always to buildings in the historical centre of Genoa or the wider Ligurian region chosen in agreement with one or more town or regional institutions ("Soprintendenza BB. AA. AA" of Liguria, "Regione Liguria", "Provincia" and "Comune di Genova", authorities of Ligurian towns, private and public bodies). In this way, the results obtained at the end of the curriculum can be acquired by the interested institutions as a "real service" offered by the School. This range of activities includes, as well, the active participation of students to restoration building sites, while the preliminary analyses and the interventions on chosen buildings are carried out by the students with the aid of scientific facilities available in the laboratories of the School. Besides the laboratories available in the School, the students can use, in fact, the facilities offered by the Department of "Earth Sciences" of the University of Genoa and those of the "Accademia Ligustica", while an agreement with the "State Archives of Genoa" allows the students to acquaint themselves with the techniques of document analysis. A special contribution is finally offered by the "Opificio delle Pietre Dure" of Florence, through scientific assistance, special seminars, additional didactic courses and laboratory tests. The main target of the School is therefore to go beyond the classical academic teaching patterns, which are sometimes abstract in content and based on a hypothetical reality, to achieve concrete results which can be pursued if the didactic possess solid and realistic bases. For this reason, in an attempt to make the training more realistic, studies and projects are always related to a real objects; historic buildings with a customer that intends to use the results of the analysis carried out by the School. "S. Nicolò del Boschetto" Abbey, in Genoa Cornigliano, taken as work subject during the biennial course 94-96 with the purpose of documenting a financial application to regional authorities for its restoration. The Church of "Santa Maria delle Grazie la Nuova" in the historical centre of Genoa, the survey works on which are being offered to the management of IACP (Low Cost Housing Agency) so that same may be included in the restoration project in preparation by that Agency. Restoration project of the "Rapallo Castle", subject of a final thesis in 1996, contracted by the Municipal Administration for a programme financed by CARIGE Bank. 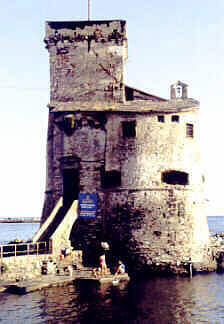 Restoration project of the "Town Tower of Rapallo", contracted by the Municipal Administration for the years 1997-98 (intervention now concluded with the restitution of the ancient castle to the town). In 1999-2000 students worked on the "Valle Christi Abbey", a Cistercian church on the Ligurian coast, close to Rapallo again. Finally, our students are now working on the archaeological rests of "Santa Maria in Passione" monastery, in the historical heart of Genoa, while other groups are employed in the preliminary studies on the rests of "Morciano Abbey", in Romagna, and on other monuments in different regions of northern Italy. We can thus say that there is a great number of study-cases which testify the activity carried out by the School and, moreover, the achieved results have a great scientific and technical interest for our future research in the field of analytical and diagnostic non destructive tests. Geometrical and structural studies carried out with the aid of computer aided models (solid and wire-frame models, 3Dmodels, DTM and so on);. Chronological analyses: archives investigation and historical research, methods of dating, archaeometry, architectural stratigraphy, carried out with the help provided by the "Arcaeological laboratory" wich activity is described in a better way in another paper to the congress (see the paper by A. Boato-D. Piattaluga). Analysis of the decay phenomena and of static instability, using: empirical and laboratory techniques, (to recognise and characterise deterioration phenomena) like: image processing techniques, empirical characterisation throughout Normal Recommendations and scientific inquires with laboratory tests; measures of humidity; analysis of biological deterioration; analysis of physical and mechanic alteration (through non destructive tests, in situ or in laboratory). monitoring of qualitative and quantitative realisations. To experiment innovative technologies for the restoration projects, trough the development of the process currently in use, with the support of virtual reality (previsions, in similar shape, of the results) and image processing resources. We have also the purpose to emulate environments generated from historical reconstruction, formal and material integration, building variations. To use simulation methods for conservative operations, to extimate the planning choices and the compared study of alternative solutions. To adopt special visualisation techniques (simple and matched rectification of normal photos, pattern recognition, computer vision, 3D rendering and modelling, automatic transformation of raster images into vector and digital images, editing of interactive thematic maps) to perform a real-time crossed comparison between the informations acquired in the analytical phase of the process, the choices of intervention and the relative tenders and estimates. Within the last experiences we tried, right for this reason, to experiment innovative technologies for the architectural restoration project, developing the practices commonly used in that field, also with the employment of different resources offered by virtual reality techniques. The attempt to reach a significant achievement of professional skills leads, moreover, to set out a protocol of technical practices, for the simulation of conservative operations, during the planning stage. We want in fact to evaluate different solutions, both under a quantitative point of view (for example: size and costs of works), and under a qualitative point of view (i.e. correctness of technical practices and preventive analysis of the results). Editing of interactive thematic plans describing, in real-time, quality and quantity of building materials, of degraded surfaces, and restoring operations. Simulation of conservative operations in aim to prevent them in virtual form and make results verifiable. The School can develop its didactic and experimental activities thanks to the MARSC Laboratory (Analytical Methods for Restoration and History of Construction) and of the Laboratory of Archaeology of Architecture. 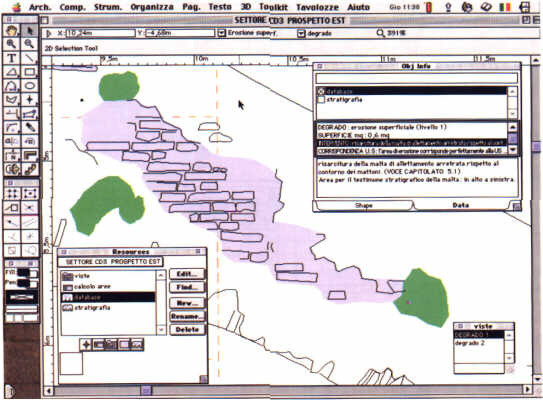 The first one, in particular, set up in 1988 and officially ranking as "Laboratory of high scientific complexity", carries out several researches, services and educational activities in precision topography, analytical and digital photogrammetry, 3D and solid modelling, digital image processing, degradation analysis, experimentation of stone material restoration and preservation techniques. Carrying out both theoretical and experimental researches, the laboratory can also provide services to the public and private bodies involved in restoration and it can rely on equipment and qualified technical personnel briefly listed below. Total topographic Station DTM5 Nikon - Theodolite Leica T100 50 cc/20 cc - Laser diastimeter Disto Leica, with attachment for Theodolite Leica T100 - High precision laser rotating level Topcon - Total motorized station Leica TPS1102, Professional Series, with fittings. Digital camera Sony - Digital camera Nikon Coolpix 950 - Semimetric photocamera Rollei 6006, with 40mm wide-angle and 150 mm telephoto lens, with fittings. Analytical 1° order stereocomparator Galileo Digicart 40, with service graphic station and several softwares, such as Wincart, for digital plotting; Macro, for on-line e off-line editing; Close range, for close photogrammetry; Trioss for aerial triangulation; Reseau, for delicate plotting from semi-metric cameras; GPM, for graphic plotting - 2° order Sterocomparator , Galileo Stereobit. 1 Digital stereorestitution system RFD - Geotop - 3 Digital stereorestitution systems Stereoview Vectar/Nikon with related management softwers - 3 Digital straightening systems Rolleimetric MSR 3.0 Rollei. workstations for Macintosh and Windows operating systems - scanners, of which one high-resolution - laser printers - A2 Ink Jet printer - Ink Jet A4 Color printers - Cd writers Lacie - A0Plotter, with fittings. d) HouseMap, for computer-assisted "longimetric or direct" survey - TopCad, for bidimensional graphic editing - Autocad 14, for graphic editing and tridimensional modelling - Zoom, for solid modelling and rendering - Galitop, for topographic survey calculation and adjustment - Olympus (Palladio module), for trilaterations adjustment - Optilab, for digital image processing and analysis - Survey Office Leica, for topographic survey calculation and adjustment - CumTerra, for DTM model management - GIS. B - Laboratory of archeology of raised structures. The following equipment is available, too. The image shows an example of the different thematic-maps, with the correlated data-bases, constructed to collect and use the different kind of data deriving from the analytical and diagnostic phase of the studies carried out by the students and to develop the restoration project. 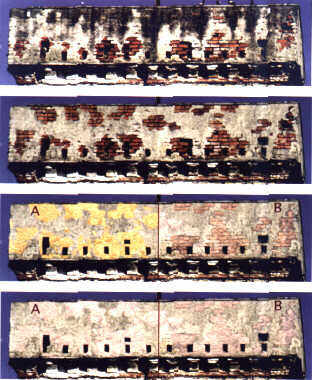 The image shows how we use image-processing techniques to explore and evaluate different solutions for the intervention, during the construction of the restoration project. This image, related to the upper part of the tower of the castle which was affected by several decay phenomena, was aimed to choose the best solution among a wide range of different "simulations" (conservation, cleaning of the plaster surface, integrations...).